When I started writing this feature about Kaleo, it confirmed why he was chosen for this month’s issue. As I prepared to call him, I saw a television program which featured Pilanca and his dad Moon, as they prepared to spend some time together at the beach, surfing, paddling, and just having a great time! I immediately contacted him, only to find him busy doing homework and orchestrating bath time with his young sons. His response was, “Can I call you later?” He later sent a text to let me know that it was getting late, and he needed to tuck them in bed, so he would contact me even later. Pilanca is the true “Mr. 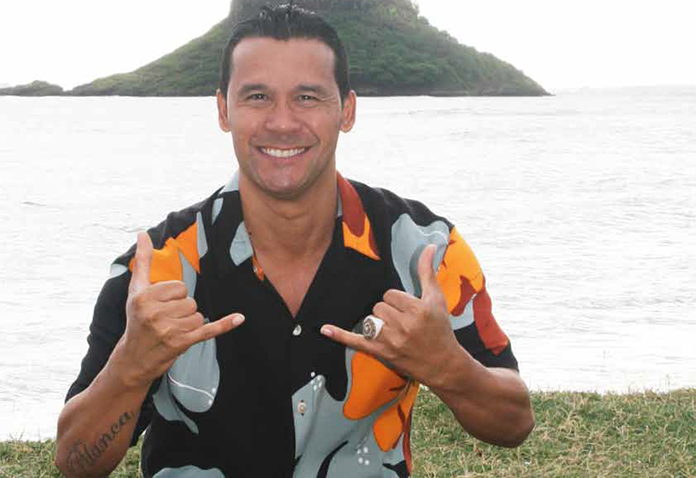 Aloha.” When we surfed together, and even on a photoshoot, he warmly greeted everyone with “Aloha.” Yes, everyone. However, Pilanca defers this title to another, and says that Uncle George Kam is Mr. Aloha. Pilanca lives life to the fullest. Every moment is endowed with a good spirit, positive vibes, feel good energy, and the glow, the “Nahenahe”. 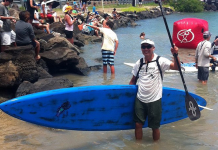 Growing up in the Waiahole Valley Road on the Windward side of Oahu, Pilanca has surfed his home breaks, including Kualoa Point, Rainbows, BB‘s, Crouchings, Kapapa Island, Sugar Mills, Kaaawa Lefts and Kahana Bay. This Kamehameha Schools graduate attended college in Washington, bringing his surfboard so that he could surf, while he attended Eastern Washington State University. This was in spite of the fact that there was no available surf for hundreds of miles. 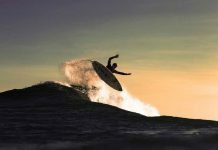 However, his board was available, while he earned a degree in recreational therapy. The ever-active Pilanca also makes it a priority to have “our time” with his wife CJ. They find the time, in between her taking care of the kids, being his partner in business, a DJ, and an event planner, as well as her job in the air. How is that for having a busy family life? 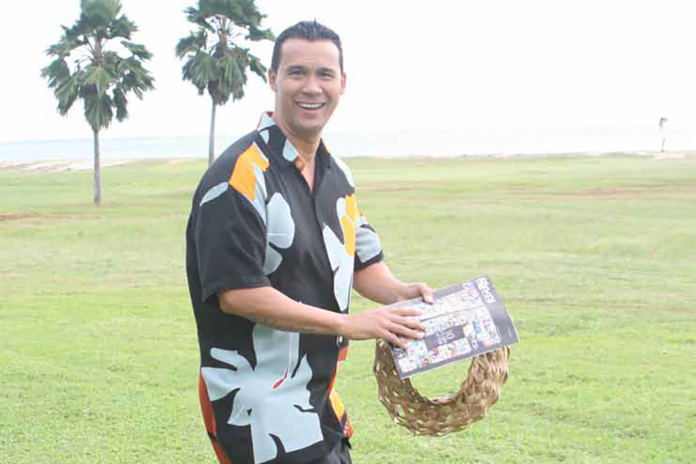 Kaleo is also working on a new television show, “Kaleo‘s Ohana Adventures,” which is set for presentation this spring on OC16. When asked how they met, Kaleo and CJ responded with two similar but different answers! “I waited as Kaleo filled up his beverage before going to the golf cart. I remember that we argued about who was going to drive the cart, and I finally sat in the passenger seat. Kaleo was busy fumbling with his phone and his drink, so I decided to press the gas pedal. He had on his shades (and made sly) but I knew that he was trying to check me out. The next thing I know, I almost fell out of the golf cart because we hit the curb. Whiplash! Fast forward to a week later, when I started getting Facebook event invites from him, for all his future fundraisers and his big comedy show. I just knew I was going sweep her off her feet, and end this with a bang! Hole in one! Nah, nah… Actually, we had our first lovers spat right there, the very first time we met. We argued about who should drive. Being the man, I knew I had to drive and be in charge, and as we drove off, I dropped my phone between my legs, and tried to get it. Meanwhile, I lost track of where I was going, drove off the curb, over some roots, and almost into the water hazard! CJ screamed, so I comforted her, made sure she was ok, and made sure she didn’t have whiplash, because she was holding her neck. I really don’t know what I did that day, but it must have worked, because after that, she couldn’t get enough of me. I began to see this lovely young woman at all of my fundraisers. One after the next. She was stalking me! On these outings, the younger Pilanca assists his dad onto a longboard and pushes him through the gentle waves. 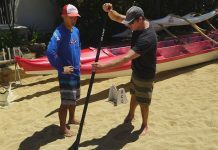 He coaches him through exercises with a canoe paddle, while his dad keeps a cadence and switches to alternate sides. All the while, his dad recalls his own time in the canoe. It is time well-spent for both of them. When asked who his comic inspiration is, he replied, “George Burns.” Pilanca explained, “He was smooth on his delivery, clean, and the crowd loved him! He did this till he was 100 years old! What could be better?” Other comedians that he admires are Robin Williams and Eddie Murphy. Pilanca is an island entertainment treasure, and we all hope that he will be sharing his brand of “Aloha” until he is 100 years old!